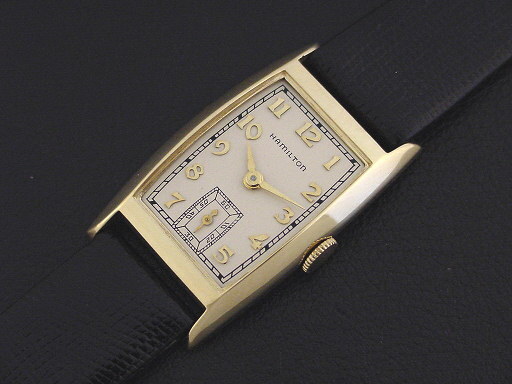 Rare Hamilton “Cameron” men’s Streamline Moderne design Packard Motor Car Co. presentation wristwatch in solid 14K yellow gold, circa 1938. Hamilton's prestige and reputation for quality made it the watch of choice for special presentations, awards, and gifts of esteem for American business. 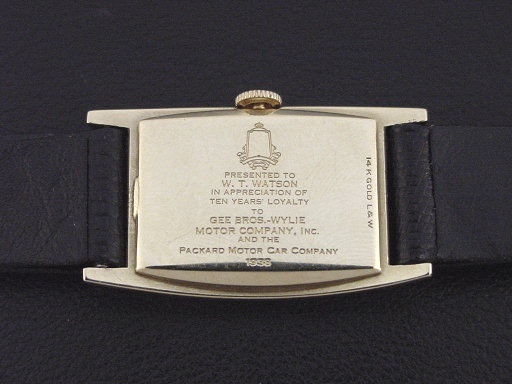 Hamilton produced this specially engraved version of its “Cameron” model for the Packard Motor Car Co. in 1937 and 1938 as awards for employees with 10 years of service to Packard. 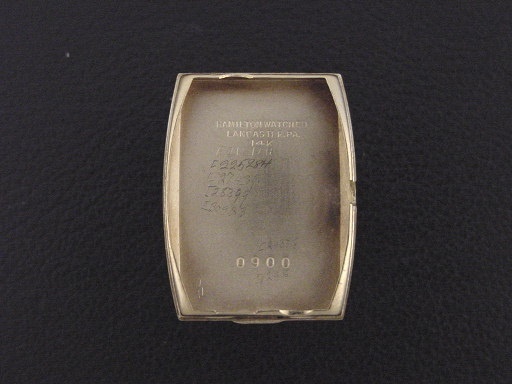 These were special order watches and the presentation inscriptions on the casebacks were acid etched at the Hamilton factory prior to shipment. 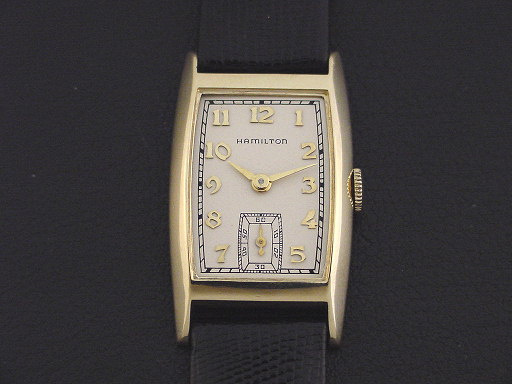 The Hamilton records note that the dials for these watches had a special white matte finish instead of the usual silver Butler finish, and that the watches were fitted with black pebble-grain straps. 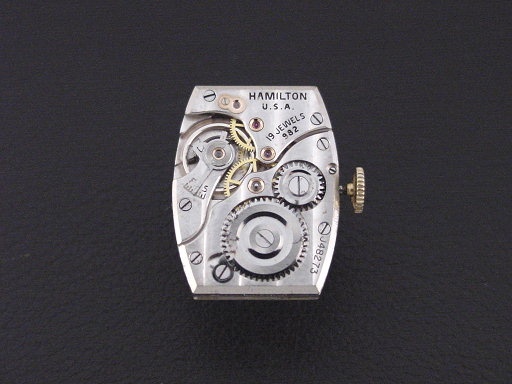 Hamilton only produced 339 of these watches for Packard and this is the first I have offered in more than 10 years. 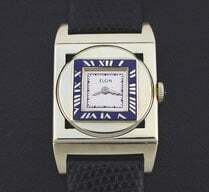 It is in crisp, excellent condition showing only very light wear. Caseback is excellent and bears the special Packard crest and presentation engraving for 10 years of service to the Packard Motor Car Co. Case measures 37mm long and 22mm wide. 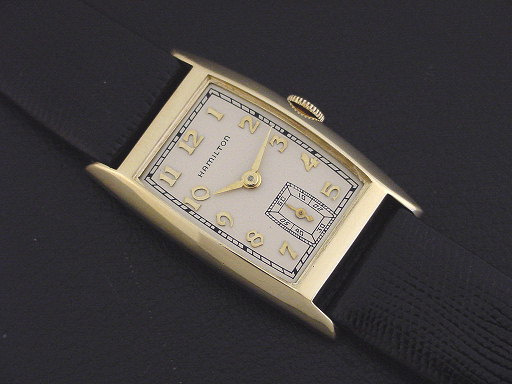 Restored special white matte finish inlaid enamel dial is superb, has solid 18K gold applied numerals. Has new glass crystal. The watch is powered by its correct 19-jewel Hamilton grade 982 manual wind movement, just serviced and running strong.